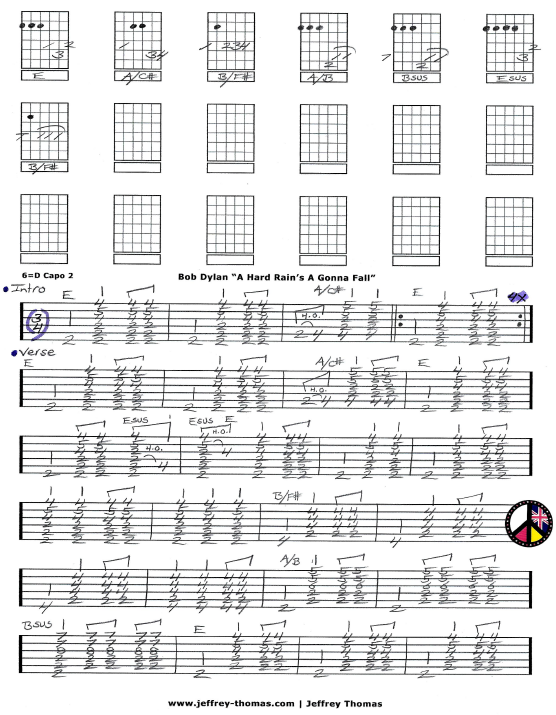 A Hard Rain’s Gonna Fall Free Guitar Tab by Jeffrey Thomas. Learn to play the signature licks and structure for this classic folk guitar tune by Bob Dylan. I have the intro, verse, pre-chorus, chorus and final chorus with ending notated. My tab follows the studio version from studio album “The Freewheelin’ Bob Dylan” and as the song continues the guitar playing stays the same only changing in length to accommodate additional lyric content. If you would like the full guitar tab for free just send in your email address using the form on this page. Want to try a free Skype guitar lesson? Just fill out the Schedule A Free Lesson form and I would be happy to meet you on Skype. Dylan said the the lyrics to this song were taken from initial lines of songs “he thought he would never have time to write.” Find more cool, unique online guitar tabs on my blog, video and tab pages.